Next up in our series on the best ways to use Amex Membership Rewards points by region is Europe. Without a doubt, it’s one of the regions we’re asked about most frequently, and there are a ton of opportunities to use miles for these transatlantic flights. If you have Membership Rewards points, your best options will often be with region-based programs (meaning you can fly from anywhere in North America, to anywhere in Europe, with connections allowed, for the same price) but there are a few times when a couple distance-based programs (where the price is determined by the actual miles flown) can really come in handy. We’ll be discussing both so you don’t miss a great opportunity to use your points. We’ll also look at options to book with Oneworld, SkyTeam and Star Alliance partners as well as a couple programs with individual partnerships. Now, let’s dive into some of the best ways you can book awards to Europe! Air Canada might be parting ways with Aeroplan in 2020 but, until then, we still have some great ways to use Aeroplan miles to book award flights to Europe. If you book a round-trip award you can even include 2 stopovers or one stopover and one open jaw. While Aeroplan does pass on some surcharges when you book an award on LOT, they are reasonable. The economy award price of 30,000 miles to Europe 1 isn’t quite as cheap as some other Star Alliance options but you can book one-way awards and avoid surcharges with several partners. A clever way to book awards to Europe 1 is to route through Istanbul (IST) on Turkish Airlines — surcharges aren’t too bad. Because IST is part of Europe 2, you won’t be able to stopover without paying the higher price, but won’t be penalized for connections under 23 hours and 59 minutes. Business class awards to both Europe 1 and 2 are reasonably competitive — ANA has the best Star Alliance rate as you’ll see below — and again the ability to book one-ways might be what you need. Beyond that, points transfer instantly between American Express and Aeroplan, which is a tremendous advantage over ANA. If you want to book a first class Star Alliance award to or from Europe, your options will effectively be limited to Lufthansa. Yes, Swiss Air has first class but good luck booking with Aeroplan (or really any other Star Alliance partner). Fortunately, Aeroplan has pretty good online search functionality and you can book online as well. However, searching for itineraries with connections sometimes gives it trouble. If you’re having trouble getting what you want, search segment by segment and call Aeroplan to book (1-800-361-5373). There is a phone booking fee of C$30 (~$24), but the Aeroplan agents are fantastic. You can transfer Membership Rewards to Aeroplan at a 1:1 ratio and these transfers generally process almost instantly. Make sure you find award space before transferring. Air France-KLM Flying Blue recently updated its program to be a bit more like Delta — variable award rates with less transparency. Previously, it was a simple region-based award chart but now you’ll want to check the Flying Blue calculator to determine the fewest miles required on a particular route. While Flying Blue does pass on surcharges on many partners, it does provide some very competitive award rates on a number of routes to Europe. If you can find a one-way award from the U.S. on Delta, you can avoid some of the steeper surcharges you might find on Air France. While business class remains the same on each route, economy varies. In fact, this also holds true for awards to Israel — yes, Flying Blue considers Israel (and North Africa) as part of Europe. Business class awards to Tel Aviv (TLV) are 53,000 miles from each of the example airports while economy rates vary from 25,000 to 29,000 miles. If you were to book awards to Vienna (VIE), business class could go for as low as 55,000 Flying Blue miles from IAD and as many as 72,000 miles from LAX — in some cases, you might actually be better off booking with Delta SkyMiles. However, the economy rate from these four airports is 21,500 miles across the board. Flying Blue also offers Promo Awards to limited cities each month that provide discounts of 25-50%, though prices vary with this new calculation system. These promo awards cannot be changed or refunded. Clearly, knowing what to expect will not be the easiest with Flying Blue anymore. The biggest advantage, however, is that Flying Blue makes more saver-level award space available to their own members. If you’re looking for four business class seats, it may be worth paying the fuel surcharges to have access to the extra award space. You can search for and book SkyTeam awards from either Air France or KLM’s sites. Unfortunately, they made another extremely customer-unfriendly move and removed the ability to run a calendar search. Now, you have to search one day at a time. Transfers from Amex to Flying Blue are 1:1 and process almost instantly. Though some phone agents (1 800 375 8723) will say it’s not possible, I have been able to put awards on hold for 48 hours. Given the historical problems with “fraud prevention”, we would always recommend calling Flying Blue to hold your award before transferring points, and then ticketing the award over the phone using a credit card in the account holder’s name. Like Aeroplan, ANA Mileage Club provides another great way to book Star Alliance partner awards to Europe. You can include a stopover on a round-trip award and get the best economy and business class award rates. The third limitation is that transfers from Membership Rewards to ANA take 48 to 72 hours, so you’ll want to have a backup option in case award space disappears. While you might have to jump through a few hurdles to find an award that avoids the surcharges, it can be very rewarding. A round-trip business class award is only 88,000 Mileage Club miles while a round-trip economy award is 55,000 miles. To book with ANA Mileage Club miles, you can run a search on ANA’s site and complete the process there. However, because you’ll need to search round-trip or multi-city, I find it’s often easier and saves time to search one-way awards with United or Aeroplan first. Transfers from Amex to ANA can take 2 to 3 days and ANA won’t hold award space for you so keep that in mind before you transfer. For good reason, the Delta SkyMiles program often takes a lot of grief. However, you can book one-way awards on SkyTeam partners (and Virgin Atlantic) from the U.S. and avoid some pesky surcharges. Delta surprised just about everyone recently when they reduced the mileage requirement on partner awards to Europe. Now, they still aren’t back in line with awards on Delta’s own flights but it was a welcome move. You can book Delta flights for 30,000 SkyMiles in economy while business class will cost 70,000 SkyMiles. For partner awards, you’ll need 32,500 SkyMiles for economy and 75,000 SkyMiles for business class. You’ll notice that Air France-KLM Flying Blue will often require significantly fewer miles to European cities, but routes such as ORD-AMS will require 71,000 Flying Blue miles compared to 70,000 SkyMiles on Delta. While 75,000 SkyMiles might be just a bit more to fly a SkyTeam partner, you can save a bunch of cash by avoiding the surcharges — except when flying Aeroflot — that Flying Blue would impose. You also get access to Virgin Atlantic awards, which has better availability for multiple passengers than other Delta partners. However, if you’re looking to book travel originating in Europe (either a round-trip or one-way), fees and surcharges on Delta awards will be very high, so you might as well use Flying Blue. With award space on Virgin Atlantic and Aeroflot, you might want to reconfirm space exists by checking Virgin Atlantic and Expert Flyer, respectively. If there’s one thing I like about SkyMiles, it’s that you can search with flexible dates — including an option to view award space in a 5-week window. Once you find saver level award space, you can select your flight and book directly online. The 1:1 transfer should process almost instantly so you don’t have to worry too much about award space vanishing. Annoyingly, Amex will charge a small fee to transfer to domestic programs which includes Delta. Don’t worry, it’s a small fee. If you’re still bemoaning the American Airlines March 2016 devaluation, you’ll want to give Etihad Guest a look next time you’re booking an American flight to Europe. You won’t be able to book a connecting flight within Europe on the same award, but you’ll be happy with the redemption rates on American flights. Provided, of course, you can find saver level award space on American, which can be hard to come by. An economy award on American Airlines typically requires 30,000 miles one-way with either American AAdvantage or Etihad Guest — I’ll let you decide which miles are easier to earn. However, Etihad Guest requires fewer miles than American for off-peak economy awards at 20,000 miles versus 22,500. Even more exciting is Etihad Guest’s premium cabin rates. Business class is 50,000 Etihad miles one-way while first class is 62,500 miles. American AAdvantage requires 57,500 miles for business class and first class is 85,000 miles. That’s a savings of 7,500 and 22,500 miles, respectively. Etihad’s site does not allow you to search for partner awards so you’ll want to search for award space on American Airlines with British Airways or Qantas. Once you find award space, you can call Etihad to book. I’ve found the call center (1-877-690-0767) in Serbia to be well-informed and easy to work with when I’ve booked partner awards. As with our other options, transfers are 1:1. You’ll often find that these transfer process almost instantly so you can transfer and book quickly. While using Flying Club miles to fly into London on Virgin Atlantic or Delta will bring some crushing taxes and fees, you’ll be happy to know it’s a great program for booking non-stop Delta awards to other European countries. Economy awards on Delta are priced at 30,000 Flying Club miles for a one-way award — pretty standard, and you can get that with SkyMiles too and even lower with Flying Blue. Non-stop business class awards are where Flying Club really shines. For 50,000 miles, you can book a one-way business class award from the U.S. to Europe. The key to using Flying Club is finding non-stop routes as you’ll be charged separately for each segment if you need a connection. Adding a domestic business class segment would add 22,500 miles and bring you to a total of 72,500 miles. If you book round-trip awards or one-ways from Europe, the surcharges will be very high. Booking awards with Virgin Atlantic Flying Club might be one of my favorite options. Not just because it has some very good redemption rates, but because you can put awards on hold for 48 hours, and phone agents are some of the best I’ve seen. Since transfers from Amex — 1:1 ratio — generally process within 12 to 24 hours, putting an award on hold is a great way to ensure you have the award space locked in first. You can search for award space on Virgin Atlantic’s site — if it has issues, use Delta — then call Flying Club (1-800-365-9500). When searching on Virgin Atlantic, you might find that after entering the departure airport, you won’t be able to enter the destination. To fix this, click the teardrop pin in the destination field, select the appropriate country then your desired airport. Select Pay with Miles and then choose to search flights within 5 weeks so you can see all dates near your desired departure date. The above options will provide you a broad range of options when booking award flights to Europe, but there are a few award options that could fit some specific travel needs. That’s a totally rational reaction, in my opinion, as Emirates levies steep surcharges on its awards. The taxes and fees on round-trip business and first class awards will be roughly $1,140 on each fifth freedom route from the U.S. — JFK-Milan (MXP) and Newark (EWR)-Athens (ATH). A one-way award from JFK or EWR will incur about $550 in taxes and fees. The redemption rates on these routes will be the same at 135,000 miles for a round-trip first class award and 85,000 miles for a one-way. Business class will run you 90,000 miles round-trip and 62,500 miles one-way. But, if you’re looking for non-stop premium cabin space to Athens, it might be a worthwhile option. Booking with Emirates Skywards also makes you eligible for a chauffeur drive which can be a fun perk if your drop-off/pick-up location is within range. Transfers from Amex are 1:1 and process almost instantly. You can search and book online with Emirates’ site. If you’re looking for a fun way to book a business class award to Madrid (MAD), check out Iberia Plus. You can book a non-stop business class award on Iberia for 34,000 Avios from Boston (BOS), JFK and ORD, and there are occasionally Iberia award sales as well. I don’t know about you, but I’m happy to book a business class award for just a little more than many programs charge for economy awards. Your transfers (1:1 ratio) from Amex could take 1 to 2 days so keep that in mind. You can search and book online with Iberia. Singapore Airlines has two fifth freedom routes to between the U.S. and Europe — one from JFK and the other from Houston (IAH). Flying JFK-Frankfurt (FRA) or FRA-JFK is the one route with Singapore Suites for that touches the U.S. Of course, award space on this route is not always the easiest to find. If you do find Suites Class award space, you can book it for 76,000 Singapore KrisFlyer miles one-way. A business class award will cost you 65,000 KrisFlyer miles. The IAH-Manchester (MAN) is operated by an Airbus A350 so you won’t be able to book a first class award, but you will be able to check out one of Singapore Airlines’ newer aircraft. The mileage requirement from IAH is the same at 65,000 KrisFlyer miles. As with our other examples, you can transfer Amex points at 1:1 ratio. The transfer will generally process within 24 hours. To book, simply uses Singapore Airlines’ site to search and book. Amex Membership Rewards really shines when you need an award to Europe. The biggest thing to watch out for with many airline partners, though, is the surcharges. If you can avoid airlines that will include surcharges, you can save a ton of cash — or, maybe they don’t bother you too much. How have you used American Express points to Europe? Etihad Guest only charges 50,000 miles for *first* class on American if space is available, which makes it a whopping deal. Thank you for these guides! Could you also comment on the availability of the award seats for each of these options? For example, over the past 3 years I had no issues booking three award seats on AirFrance, from the East Coast to Europe, even when booking days before flying, during peak season. However, finding seats from the East Coast to Africa (Seychelles), 10 months in advance, seems to be very difficult for more than two award seats. How about 44,000 Etihad Guest Miles from IAD/JFK to BRU one-way? I am looking to fly JFK to CDG in late August / early September. I need two tickets, and I have 70,000 FlyingBlue miles. Is buying a coach ticket and upgrading to business class with miles on the outbound (35,000 miles per ticket) a good use of miles or a poor one? Cash tickets seem to be $8,000 plus, and mileage redemptions seem to cost 100,000 each way. I’m not really flexible on timing. Most bloggers just discuss all the flights and destinations points and miles can fly them to. Business class to Paris, F on CX… a novice reader would think that after signing up for a couple credit cards, all they have to go is pick up the phone and book any J or F flight to about destination they choose. Unfortunately, most blogs don’t mention that finding availability is generally more difficult than earning the miles and points, unless you’re really flexible. @Alpha – Gotta love that manual pricing. @Sam Zia – IAD/JFK/YYZ-BRU are solid! Chose to stick with AA as it was more broadly applicable. I actually booked JFK-BRU r/t when it was 36,620 EY miles. Sadly, I had to cancel to be at a wedding. @Dave – Hope I haven’t given the impression that booking awards is as simple as earning the points. As with booking cheaper cash fares, flexibility makes booking awards much easier. As you’ve no doubt noticed, award space on specific carriers and/or to specific destinations during different times of the year will vary quite a bit. I used Amex points to top off my BA Avios account so I could book LAX to DUB for three over spring break next year. Both flights I wanted were available in Economy Off-Peak @ 16,250 each way. Three R/T tix for a total of 97,500 Avois + $358.95. Spencer these guides have been great! Keep it up. Could you do a similar write up on Ultimate Rewards next? I have a combo of UR and MR I wish to burn up soon. @Tav – Thanks! Glad you’re enjoying them. UR is next on the list so I hope to start publishing those soon-ish. Guys- the most under-appreciated move is to transfer Amex to Etihad guest to book Royal Air Maroc. The maximum cost is 44K miles one way for a business class award seat. They have a terrific network to Europe, the Middle East and North Africa and unbelievable award seat availability. US gateways are JFK, IAD and YUL. 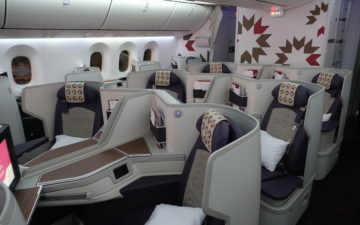 Their connecting narrow body aircraft on the European sector have proper business class instead of Euro business class (i.e. blocked middle seat). They have proper flat beds on the TATL segment. Search RAM award inventory on their website by joining their mileage program. I just booked JFK-CMN-BEY for 44K miles in J. Not only is it insanely cheap, but they also have the best schedule on many of these Mediterranean basin routes. I can’t believe that this loophole in the Etihad award chart isn’t being better exploited. Hi Spencer, thanks for the great write up! Definitely a lot of info to digest but still slightly confused and need a little help. I’ve been looking for the best option (award availability wise & not too outrageous surcharges) from EWR/JFK to Greece on preferably J (3 seats), but will settle for Y if necessary. I have both Chase UR & Amex MR points. I understand Emirates’ surcharges on J could be over $1k/person! Thanks! What’s the best way of booking LH J MCO – FRA? Great article. One question — the IAD-VIE flight you mentioned that’s bookable via Flying Blue, whose metal is it on? Is it direct? I’m holding out for another Iberia award sale. 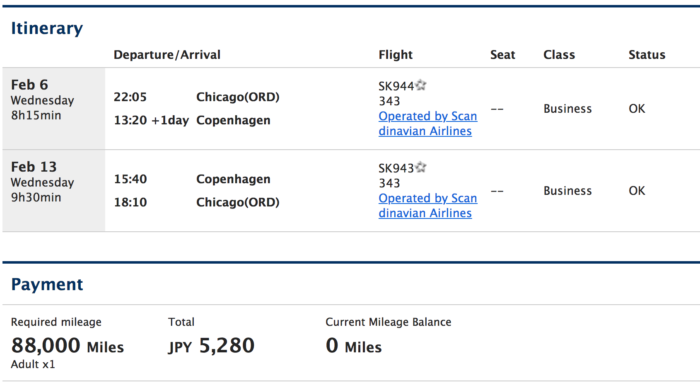 I flew ORD – MAD for 25,500 points in Business and it was great!